The photo that enraged a country. 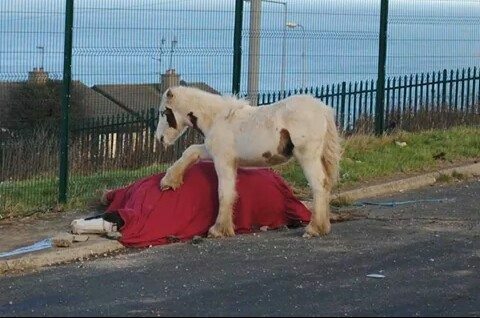 This day last year,this photo taken by Roxy Luke in Wicklow town went viral and was the driver for setting up the Justice for Ireland’s horses Facebook page. A mare needlessly murdered by individuals who knew they’d get away with it and her foal standing over his mothers body. Thankfully her foal, Hero, was taken in by the brilliant IHWT and has grown into a handsome, healthy boy. Sadly, there still are no laws to protect a mare and foal like Hero and his mother from meeting the same fate. Visit or join the Justice for Ireland’s horses facebook page here.